This brief statement by the Kansas Republican House of Representatives, led by George Douglass, was written during the Populist War of 1893 in order to affirm that the Republican Party stood for "the supremacy of law and order against anarchy." 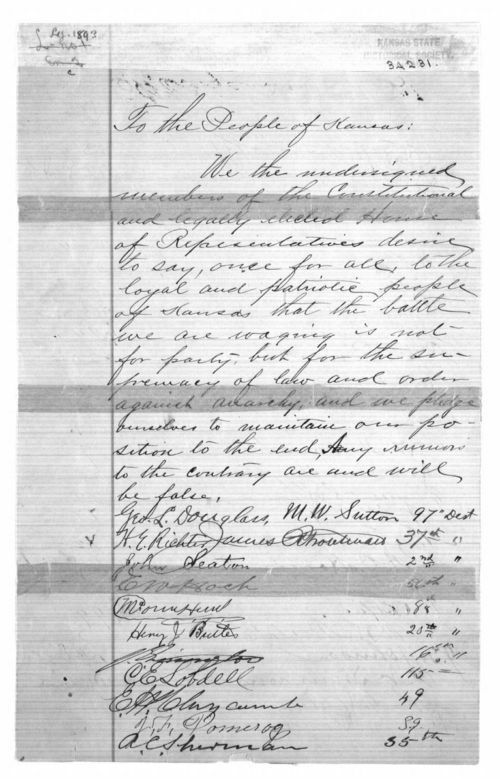 During this "war," the state had two houses -- the Populist (Dunsmore) House and the Republican (Douglass) House -- both of which claimed to have been the legally elected House of Representatives for the state. Initially the two houses had conducted their business side by side in Representative Hall, but on February 13, 1893, the Populist Dunsmore House barricaded the hall and prevented the Republican congressmen from entering the chambers. The Republican Douglass house responded by attacking the doors of the hall with sledgehammers. Both sides stood at a standstill until February 25, when a decision from the Kansas Supreme Court stated that the Republican House was the legally elected representative body. This statement would work well when grouped with any of the other sources related to the Populist War, including images of the statehouse, the photograph of Gov. Lewelling, Gov. Lewelling's orders no. 2 and no. 3, Jeremiah Remington's postcard, Floyd Bull's reminiscence, and the copy of the agreement that ended the standoff.